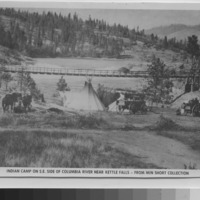 Indian Camp on the S.E. Side of Kettle Falls, with the Washington Water Power Bridge in the background. “Kettle Falls Photo Gallery: Indian Camp on the S.E. Side of Kettle Falls,” Crossroads Archive, accessed April 19, 2019, http://crossroadsarchive.net/items/show/25568.